If we aim for a balanced, repetitive, and reliable testing process, we should include requirements, test, and defect management into it. Also, we should remember about reducing costs, but maintain a top-shaped and fast release process at the same time. This puts a lot of pressure on IT managers because they need to choose the right software testing tools which will enable testers and developers to run an efficient software development process. However, it may be quite difficult when the standard test management process is divided into multiple steps covered by a multitude of tools dedicated to a specific one. What’s wrong with the standard test management process? Usually, testing process is scattered across multiple tools. Source: Blended Perspectives. and write reports in Excel. No wonder that we can frequently come across companies that use three or more tools dedicated to various parts of testing. Some big corporations may even create their own software to make the whole process unified. However, we shouldn’t exclude software testing process from the software we use to organize all our work and documents. Seeing as Jira is one of the most popular project management software, it should become a target area for test management process, yet it lacks the out-of-the-box functionality to do it. That’s why we came up with a new app that brings both requirements and test management inside Jira. Requirements and Test Management for Jira Cloud (RTM) uses Requirements, Test Plans, Test Cases, and Test Executions objects as Jira issue types, allowing us to track the whole development process from collecting requirements to going to production in a single place. 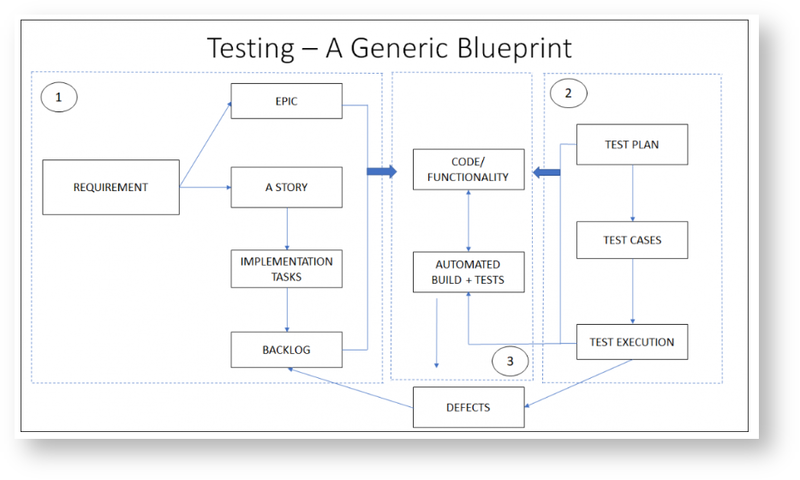 Thus, we will write the Master Test Plan in Confluence, then use RTM to document and structure Requirements, create Test Cases, aggregate them into Test Plans, execute them, and handle defects without leaving Jira Cloud. For now, we may only leave our instance to trigger the CI loop, if we have one. Requirements are probably the most important step in the software development process, because if well-defined, they directly relate to the needs of both customers and businesses. Moreover, they help with planning work, creating user stories and Test Cases, and give insight into what needs to be done to achieve project’s goal. Creating requirements as regular Jira issues displayed on Scrum or Kanban board makes managing and tracing their coverage with features and tests easier for both testing and development teams. Moreover, Requirements and Test Management for Jira Cloud allows us to store all requirements for our project in one place and structure them in a transparent tree view. Test Cases are step-by-step instructions as to what actions we should take to cover our Requirements, as well as will help us with executing Test Plans later on in the process. That’s why we should express the steps included in the Test Cases as clear as possible, and even separate complex Cases into smaller ones so that anyone can understand them. Also, we should remember about setting preconditions for our Test Cases. This way, we’ll know what we should do before executing the Test Cases correctly. RTM app also enables us to edit Test Cases with one click and order their steps with drag and drop, which makes the whole experience effortless. Moreover, Test Cases are reusable for several Test Plans, which enables us to effeortlessly prepare various scenarios for them. After creating Test Plans, we can easily execute them with only one click. Test Executions have the same structure as Test Plans – there is a Test Case Executions list, where we can monitor the current status of the Test Case Execution. Also, we can check the Test Plan Details, verify and set Relations between the elements of Test Executions, as well as assign a Test Execution to a certain person. After Test Case Execution is finished, we can easily access its result. The status bar of Test Case Executions is clear and understandable, enabling you to track progress of executing each step of the Test Plan, as well as to see where the process failed, why, and link appropriate defects to these events. we can execute the app in any browser, which makes it much more accessible than most external testing tools. Taking all that into consideration, why not give RTM app a try? Your test process doesn’t work properly?